Lilly Pilly are easy care evergreen trees with attractive glossy green leaves. and white flowers in summer. They are one of the most popular native plants in Australia and grow well in full sun to part shade. With so many varieties available for sale, you can find a Lilly Pilly plant to suit any landscaping situation. 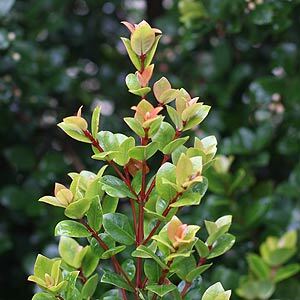 Most varieties for sale are suited for use as hedging plants, and having naturally dense foliage, being reasonably fast growing and very easy to prune, it is easy to see why they are so popular. All have bright red new foliage and all have flowers followed by white to purple berries. The berries also attract birds to the garden. The flowering time is from spring through to summer and the berries form and ripen from mid summer to autumn. The fruit can be used in jams, sauces, eaten fresh and sometimes candied. However it is as a hedging plant that they are most widely used. Lilly Pilly trees come from three related species, Syzygium, Waterhousea and Acmena. The best Lilly Pilly plant will depend on your landscaping application. You can choose from a range of heights, foliage colours and growth habits, they really are versatile plants. In general it is best to look for the size of tree to suit your needs and then to look for a psyllid resistant variety. Psyllids cause bubbles on the foliage. This resistance means that the glossy leaves remain attractive through the year. If psylids are a problem you use confider tablets. These are placed in the ground, which eliminates the need for spraying. The most resistant varieties to psyllids are the Acmena smithii cultivars, followed by Syzygium leuhmanii cultivars. Lilly Pillies are available as tall growing trees that will reach well over 5 metres. They can also be found as dwarf cultivars that can be used for low hedges at around 1 metre in height. Six of the best Lilly Pilly trees. • Syzygium australe ‘Tiny Trev’ – Very low growing to around 1 metre in height. Also consider Acmena smithii ‘Hedgemaster’ around the same height. • Acmena smithii ‘Hot Flush’ – Reaches around 5 metres and makes an excellent hedging plant. • Syzygium australe Resilience – Reaches around 4 – 5 metres and is psyllid resistant. • Acmena smithii Cherry Surprise – Low growing to around 2m in height. Very attractive new red growth. • Syzygium paniculatum Backyard Bliss – Grows to around 4 metres, excellent screening tree. Other common names include ‘Riberry’, ‘Satinash’ and ‘Cherry Alder’, with over 60 varieties they provide a range of foliage colour, especially new growth which ranges from coppery to brilliant red. Once established these are a very easy care tree. The root system is not invasive, however they are best planted away from drainage lines and pipes. All varieties require good drainage and all are very easy to prune to shape and size. When planting, dig a hole as deep as required, so that the plant will be at the same depth it is in the container. The hole should be twice the diameter of the container as this loosen the soil and encourage the root system to spread. New trees should be watered in well with some additional water through the first summer. Mulch around the tree to provide a cool moist root run. Pruning from an early age will keep the plant bushy and at the desired size. The fruit of many Lilly Pilly varieties has been used as a bush food for centuries. It is now grown specifically to supply restaurants, and food manufactures. The fruit is used to make a range of jams and jellies, chutneys and sauces, syrups as well as being candied used fresh in fruit tarts and baked foods. The fruit is also distilled to make a unique gin. As for the taste of the Lilly Lilly fruit, when properly ripe is taste a little like nashi fruit and a tart strawberry with lemon. Different species do have different taste profiles, especially S. rubrimolle, which is closer to an apple in both taste and texture.